Trials. After purchasing her, and hearing about the benefits of being involved in these trials we decided to join the local club. It was not only fun for the whole family but it kept the dogs in great physical shape as well as mentally sharp. was out of Field Trial lines. She herself followed more the confirmation body type but her drive came definitely from the Field Trial side. She would rather hunt then do anything else. loved it all. 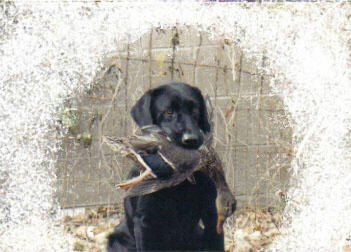 MICKI was a great dog to be around whether it be out in the actual hunting field, at an A.K.C.Field Trial, a U.K.C. Hunt Test or just out in the field training for all of them. Just to be able to watch the drive and desire that she had doing what she was bred to do made Tom and I both very happy that we were able to give her this type of life. Life is fulfilled when you are able to live your dream.